we have been celebrating our tenth anniversary in 2012 and we have developed our concept of realtime 3D client software and tools since 2002 succesfully on international markets for leading customers in CAD/GIS or Internet growth entrepreneurs. Bitmanagement evoluted technically each year and augmented its portfolio by 3D content generation in 2011. 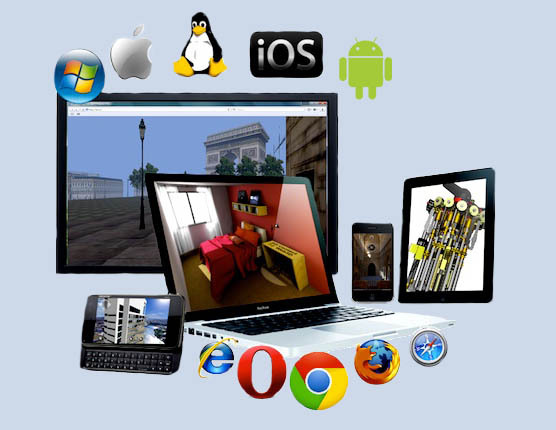 Therefore today we can develop a relevant full 3D project "all-in-one". Please download the new version 8.1. BS Contact supports touch functionality now also in 3D in desktop mode. Windows 8 has been especially designed for hybrid users, both for their daily work on the desktop and also on the move for quick browsing with touch input in the metro mode. 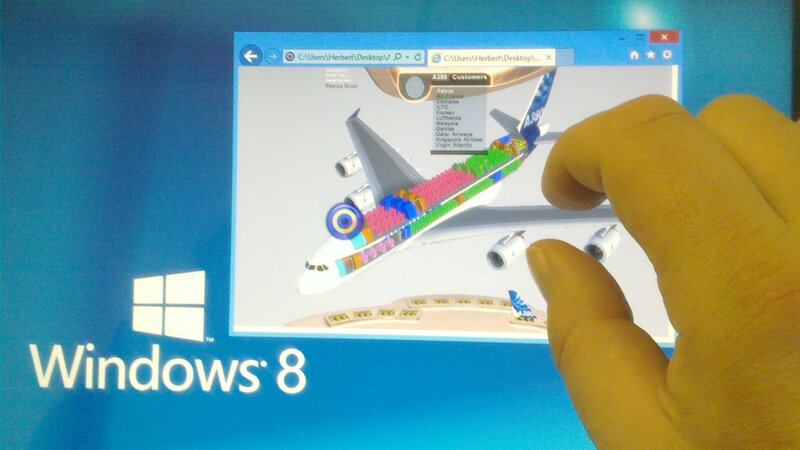 You can use raw input as well as touch navigation with windows 8 in BS Contact. BS Contact 8.1 supports deferred rendering with a new lighting and shadow experience. Deferred rendering or deferred shading is a magic word in nowadays computer graphics. In principle it is a method to separate the geometry calculations from the computation of lights. Modern graphics cards can do these calculations faster separated than the renderer as a piece of software on the computer. So, many hundred lights are possible in one scene. 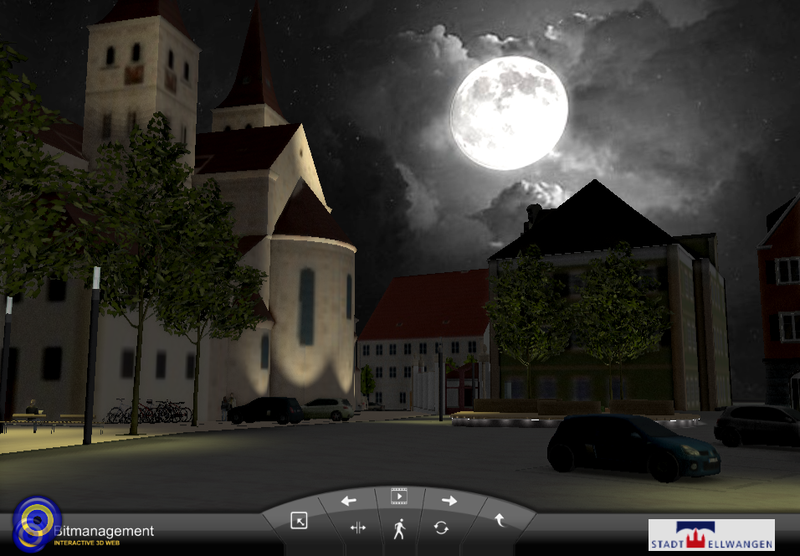 The following screenshots shows about 250 lights with high interactive frame rates produced in realtime on a laptop computer with BS Contact in DirectX within a high resolution city model. Who can remember the old restriction of only 8 lights in OpenGL? The image above shows a scene with light features. Instead of directional light, spotlights are used that stem from light bulbs on ground. Also the light is cast on the trees from the ground to make them appear in the dark. 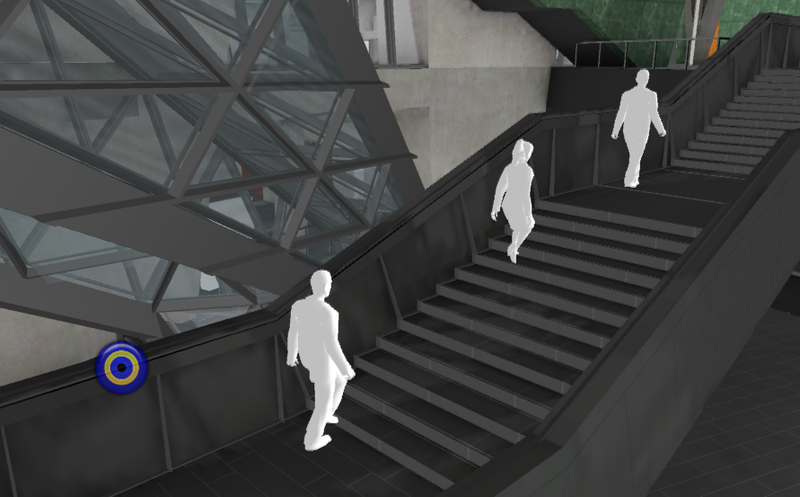 Your avatars will walk freely and find their way automatically over steps and little obstacles. So you provide only a path for them and you do not need to care about the movement. In order to optimize the download rates in the R&D project FINE Bitmanagement has implemented a clustering decimation algorithm that subdivides the 3D space into the cells of the user defined size. The original vertices of the mesh are checked for their proximity to the nodes of the virtual grid. The vertices placed closest to the nodes of the grid are left in the mesh. The rest of the vertices are removed. This algorithm provides a uniform distribution of vertices of the target mesh, even if the vertices of the original mesh were not placed on a raster. The BS Contact Mac 3D engine supports now additional to Safari also Firefox and Chrome as browsers on the latest operating systems Lion, Snowleopard and Mountainlion. Loading in BS Contact has been optimized. You can load up to 8 instances in parallel now, if they are represented in inlines(). Objects can be accumulated in parallel now, that reduces loading time. Sometimes dealing with many large inlines, it is hard to load and unload them in order to save memory in the scene. This task is now done automatically with the new inline manager that acts similar to a garbage collector and takes care of your inlines if memory limits exceed 1 GB. BS Contact Geo has an improved Geonavigation to navigate with accurate map projections. In addition to the Geofly mode you can also use the Geowalk mode now to walk on an earth surface or in the streets of a city model. The leading oil company from Saudi Arabia has prolonged for the third year licensing of “BS Contact Geo” for online Intranet visualization in GIS. 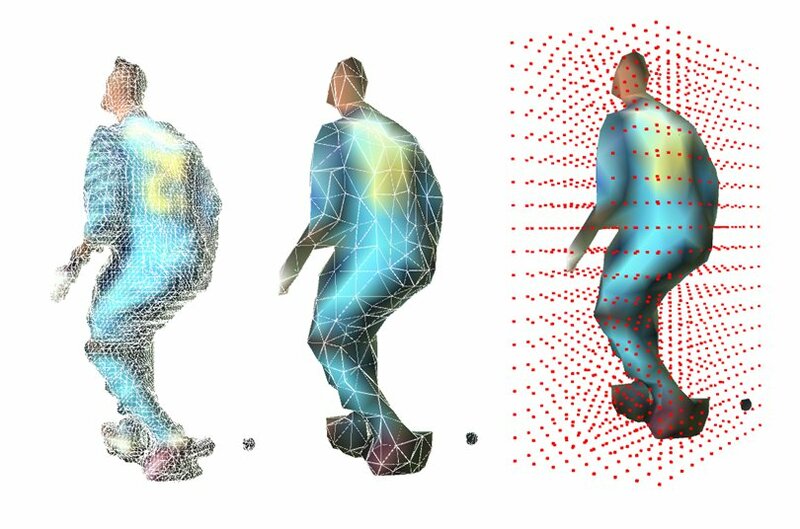 The Los Angeles based company is using "BS Contact" and "BS Collaborate" for its application of LIVE 3D AVATARs in the area of e-learning. Federal Office of Topography swisstopo is visualizing interactive topological applications with BS Contact. In the CAD area Siemens developed an new HMI (Human Machine Interface) with touch, interactivity and 3D using BS Contact and presenting it at Nürnberg fair SPS IPC Drives. For the German soccer club FC Schalke04 Bitmanagement created the football stadium called Veltins Arena indoor and outdoor as a 3D modell for virtual walkthroughs. The customer will bring it online the next days. In the real estate area the 3D visualisation of one of the key assets in the Hamburg harbor the “Speicherstadt” has been performed by Bitmanagement for marketing purposes. For IKEA we modeled the new ‘City Store’ in Hamburg, near the old pedestrian zone in Hamburg-Altona. In the area of infrastructure we modeled for a new train line the existing surrounding with the possibility to switch in the model to the 16 km of planned traffic line with wagon simulation for mediation purposes. The customer will bring it online the next days. The Free-viewpoint Immersive Networked Experience project is focused on developing a novel end-to-end architecture for the creation and delivery of a new form of live media content. FINE will deliver live content to professional and home users which will be able to interact and freely explore a live-action 3D scene. The results of this year were presented at the NAB Show in Las Vegas and at Siggraph in Los Angeles. Bitmanagement has hired experienced C++ 3D developer and extends its development capacity with focus on tool development. the Bitmanagement business letter please send us an e-mail. If you no longer wish to receive this business letter, please write to unsubscribe(at)bitmanagement.com.